You can view quiz logs to view the status of your student quizzes. This feature is also designed to help you investigate problems that a student may have in the quiz. The quiz starts the log when students begin the quiz, so some logs may show that the quiz is in progress. If you gave the student multiple attempts for a quiz, the log will always show the most recent attempt by default. However, you can view any attempt within the log. Quiz logs are only retained for six months. 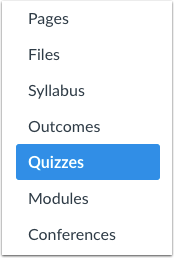 Quiz Log Auditing is currently a course opt-in feature. 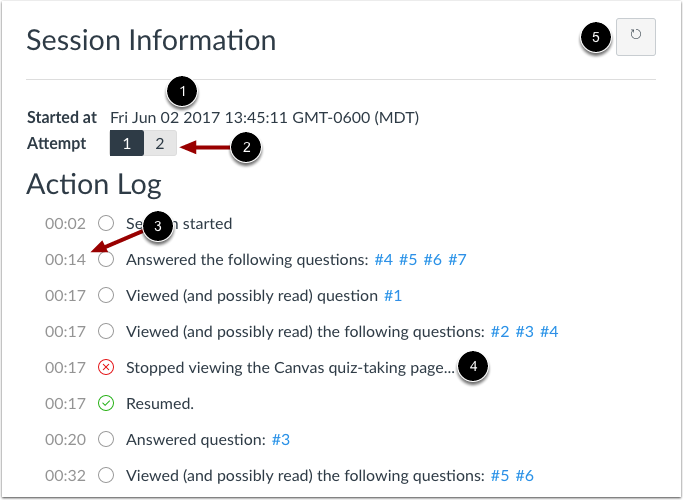 To enable the link to view quiz logs, learn how to manage feature options in the course features lesson. Click the Options menu  and click the Show Student Quiz Results option . Click the name of a student. Click the View Log link. View the session information and the action log for the quiz. The session information shows the start date and time  for the attempt . The action log for that attempt shows a timestamp of each quiz action . Actions can include viewing a question and answering a question. 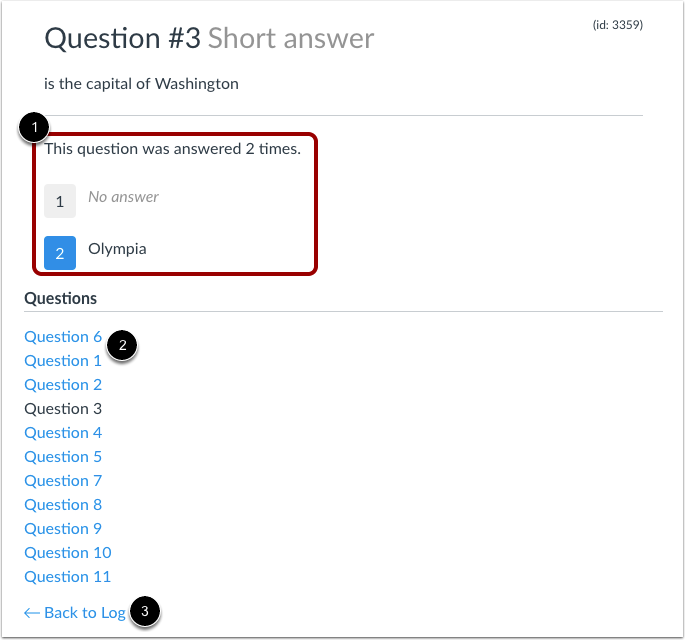 If questions are shown being answered multiple times, the student either changed the question answer(s), or the answer was generated by the quiz autosave feature. The log also shows if the student stopped viewing the Canvas quiz-taking page . 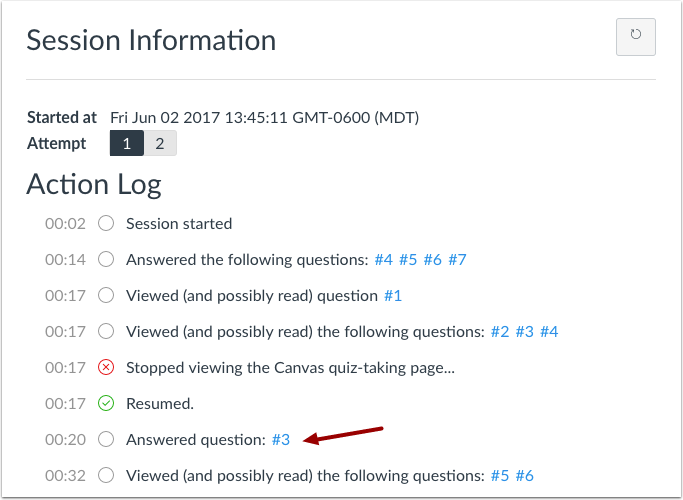 Not viewing the quiz-taking page can occur from being inactive within Canvas for more than 30 seconds (including navigating to another Canvas page), or clicking out of the quiz (such as on another browser tab or window) for more than 15 seconds. 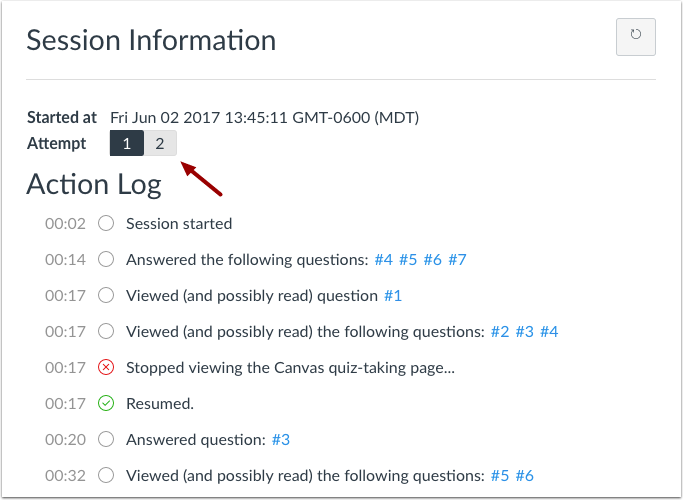 When the student returns to the quiz, the log shows the status as resumed. To refresh the quiz log, click the Refresh icon . To view responses to a question, click the link to the quiz question number. You can view the number of times the question was answered, as well as each specific attempt at answering the question . To view answers for another quiz question, click the question number . To return to the log, click the Back to log link . 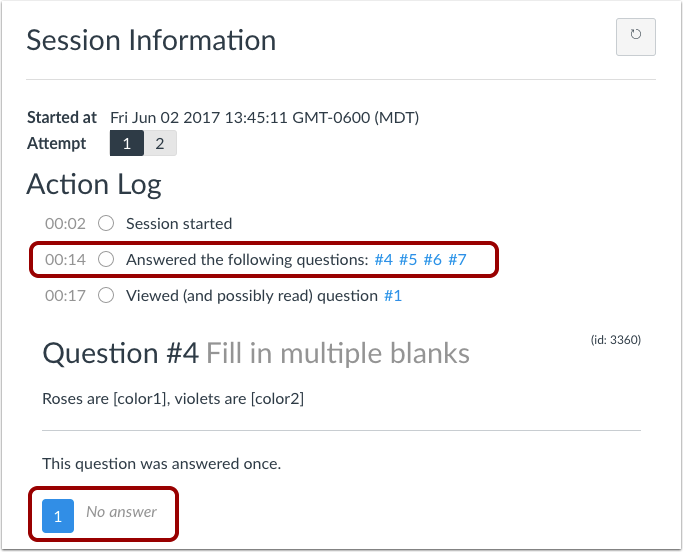 When viewing the question answers in the log, the question will show a null or no answer response for the autosaved answer attempt. If the student has more than one quiz attempt, the log always shows the last attempt. Prior attempts can be viewed by clicking the number of the attempt. Previous Topic:How do I view student results in a quiz? Next Topic:What options can I use to regrade a quiz in a course? Table of Contents > Quizzes > How do I view a quiz log for a student? Re: Set up a quiz that flows like a Case Study? Re: Why do students do still have access to quizzes after availability date? Re: Is it possible to log the time a student spent on each question?